For Emily Fisher, bumping into people has ceased to be a figure of speech. She’d tell you it’s not her fault; she’s not normally clumsy, but between being shot at and taking paths that defy geography, her life has become rather confusing. And this is before she runs into Hannah Wyatt, self-styled Instrument of the Divine, purveyor of romantic advice to lovesick teens, and, as Emily is about to find out, amateur alchemist. Emily’s day takes a turn into the Children’s religious practices in “Better living through chemistry,” chapter 20 of Prophecies and Penalties. 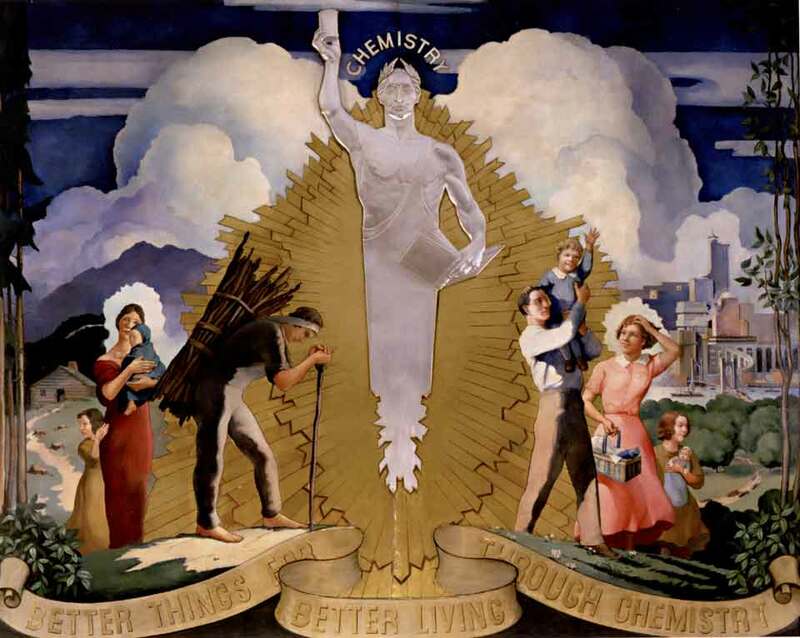 The phrase “better living through chemistry” has become so common that I suspect many people don’t realize it originated as a public relations and advertising slogan for the DuPont Company (E. I. du Pont de Nemours and Company) back in 1935: “Better things for better living . . . through chemistry.” Quite appropriate, coming from a company that began by making gunpowder and in the 20th century was one of the leaders in plastic. No doubt when Mr. McGuire advised Ben Braddock in The Graduate (1967) to go into plastics, he was thinking of firms such as DuPont. Unfortunately for DuPont, the phrase started to take on a satirical and sinister meaning starting in the 1960s. Books such as Rachel Carson’s Silent Spring (1962) pointed out the adverse effects of the new chemical pesticides on wildlife. The rapid rise of valium as a prescription tranquilizing drug following its introduction in 1963 spawned an image of drugged-out housewives that was embodied in the Rolling Stones’ song “Mother’s Little Helper” (1966). Finally, the popularity of psychoactive recreational drugs by the late 1960s gave DuPont’s slogan an entirely new meaning, one which the company no doubt disliked. Even so, they didn’t change the slogan until 1982. This entry was posted in History, Prophecies and Penalties, Writing fiction and tagged Better living through chemistry, chemistry, detective story, murder mystery, religion, religious commune, Vermont, Writing. Bookmark the permalink. It definately takes an ironic, even tragic angle where I grew up: in a town in the Haifa Bay close to a heavy indutrial zone, (in)famous for the refineries and the petrochemical industry, heavily polluting the air and water. Every time we passed there we had to hold our noses. The area is cleaner today, but lives around that area (and other similar areas around the world) certainly got worse – and shortter due to chemistry. Maybe we can adapt the phrase to make students more excited about chemistry classes? It’s interesting how major technological advancements get tainted so quickly by their environmental impact. Historically, the world was so large, and changes so slow, that people generally ignored the environmental impact of changes they made. Overgrazing? Move to the next field. Pollute a river? Move upstream. Exterminate a species by taking too many specimens for food/display/clothing? Find another. Ironically, we both upped our ability to change the environment and our ability to detect and understand that we were doing so during the course of the 20th century. For the perspective of a future business major, we’ve begun to notice and assess the externalities of our economic processes.It’s giving us a more realistic view of the economy AND the environment. But because we weren’t used to it, it’s been and will continue to be a painful adjustment. I don’t think the phrase “better living through chemistry” ever reached my part of the world – though Rachel Carson’s book certainly did. Your comment above reminds me of Jared Diamond’s ‘Collapse: How Societies Choose to Fail or Succeed’ (2005). In looking at the Easter Islands, Diamond asks a really pertinent question (one we ought all to be asking): What was that person thinking when he cut down the last tree? One of the problems is that ecological change can be gradual so that its devastating consequences aren’t apparent for some time. I think of Iceland, which thanks to overgrazing obliterated their forests and cut their arable grasslands in half. Did that Easter Islander even realize how many tress there had once been, or that this was the last? Oops, I’ve heard a different tale: that a birdwatcher, having eaten his lunch, then disposed of his rubbish down ‘a hole’. Said hole was entrance to the bird’s nest; mother couldn’t get in to feed chicks, chicks couldn’t get out. Finale. Of course, it was already a very rare bird by then – the last of its kind. So yes, the locals probably had persecuted it.